The Best Amigurumi blogs from thousands of top Amigurumi blogs in our index using search and social metrics. Data will be refreshed once a week.Also check out Top Amigurumi Youtube Channels list for Top videos on Amigurumi. About Blog Hello! My name is Sharon Ojala. A Finnish last name pronounced O-yah-lah. I design amigurumi patterns and most of them have video tutorials. I also build dollhouses out of whatever I can, like dressers and old boots! Facebook fans 96,933. Twitter followers 437. Facebook fans 40,891. Twitter followers 247. Austin, Texas About Blog Furls Fiberarts is the world's premier provider of luxury crochet hooks and other fiberarts tools. In this blog you will find tutorials for Amigurumi Crochet. Facebook fans 60,158. Twitter followers 526. Los Angeles, CA About Blog Fresh Stitches is your place for crochet amigurumi patterns, tutorials and the largest selection of animal and comic craft eyes. Here you will learn Amigurumi Crochet Patterns and tutorials. Facebook fans 569,941. Twitter followers 51. Cape Town, South Africa About Blog Hello! My name is June Gilbank, and I'm a crochet pattern designer, crochet and craft book author, multi-crafter, technical writer and animal lover. My crochet specialties are cute and realistic nature-inspired designs and elegant accessories, and I'm committed to creating exceptionally clear, accurate patterns and tutorials. Facebook fans 10,891. Twitter followers 7,160. About Blog I`m Mari-Liis and have been making amigurumi toys since 2008. lilleliis company is designing handmade toys and crochet patterns for moms to make special toys for their kids. Our toys are combining Japanese amigurumi technique with teddy bear tradition. Bigger than the classical amigurumis, they still are very simple to make. Our toys are inspired by children and meant for playing. Facebook fans 18,721. Twitter followers n/a. San Francisco, CA About Blog A subreddit devoted to amigurumi, or little knitted or crocheted stuffed toys. Facebook fans 1,117,366. Twitter followers 488,050. Denver, CO USA About Blog Discover a world of new amigurumi crochet techniques, skills for making gorgeous crochet garments and more, with the Craftsy Crocheting Blog. Here you will find step-by-step tutorials, inspiring projects, sneak peeks with renowned instructors, and endless crochet fun! Facebook fans n/a. Twitter followers 150,503. Ontario, Canada About Blog The Crochet Crowd is about community first. Led by Michael Sellick, aka Mikey. Our goal is to provide free resources such as patterns, video tutorials and more for amigurumi. Facebook fans n/a. Twitter followers 16,803. About Blog Katia is a European company which, from its earliest days, has set itself the task of freshening up the knitting wool industry. Here you will learn new amirgurmi patterns and ideas. Facebook fans 3,975. Twitter followers 68. Tallinn, Estonia About Blog HI I'm Kristi, a crocheting enthusiast living in Tallinn. I have been dabbling in amigurumi making for the last four years and have learned a few things - mostly how not to do things. But I have acquired a few bits of useful knowledge as well and now have made it my mission to share everything I know about crocheting toys with all of you. Facebook fans 7,545. Twitter followers 68. About Blog Hi ! My name is Ophelie and I'm 29 years old. I design fun and colorful amigurumis, often inspired by pop-culture, science-fiction and video games. Facebook fans 3,676. Twitter followers 21. About Blog In Supergurumi blog you will find Amigurumi Crochet Patterns. Facebook fans 3,375. Twitter followers 38. California About Blog I’m Amy. I created this website to share my love of amigurumi with the world! Please look around and I hope you find some fun and inspiration! Facebook fans 9,127. Twitter followers 174. Syney, Australia About Blog A page dedicated to those passionate about crochet, amigurumi and craft. Facebook fans 1,703. Twitter followers n/a. 17. Little Yarn Friends | Rachel H’s Amigurumi, Crochet & Crafts. Facebook fans 12,589. Twitter followers 449. Facebook fans 7,555. Twitter followers 471. About Blog On this blog there are photos and links to free Amigurumi crochet patterns, which are published every month. It's a directory to find patterns for bears, bunnies, owls, disney related or any other category. Maceió/AL, Brazil About Blog Mia's Atelier is a blog where you can find cute and geek amigurumi patterns designed by Miahandcrafter. Moreover you will find some tutorials and crochet related posts. Facebook fans 3,223. Twitter followers 4. UK About Blog The blog of a crafter and amigurumi pattern designer. FREE crochet patterns shared on this page daily! Facebook fans 16,793. Twitter followers 31,745. Netherlands About Blog My name is Bas den Braver and I am Zabbez. I love designing and creating a flower fantasy world. I put a lot of effort in making my crochet patterns and I hope you will enjoy them as much as I do making them. Zabbez blog with the latest news, updates and new crochet patterns. This blog is all about the Zabbez amigurumi patterns. Facebook fans 8,625. Twitter followers 30. Austin About Blog I started CraftyisCool in 2007 when I had trouble finding Yo Gabba Gabba toys for my little boys. I crocheted my first toy and after many requests for the pattern. Facebook fans 43,210. Twitter followers 4,704. About Blog Hi! My name is Anneris, welcome to my little world of Amigurumi Food. Facebook fans 10,521. Twitter followers n/a. Singapore About Blog Tiny Rabbit Hole has been inspired by some really awesome Amigurumi crocheters around the world and now, here we are, creating Amigurumi that I love dearly. Facebook fans 676. Twitter followers 270. About Blog A place to share and discuss cloth and crochet dolls made by hand. About Blog Crochet projects and all things that are related to this wonderful hobby. Crochet projects that will amaze You are dinosaurs, aliens, zombie pirate panda, vampires, robots, Cheshire cats and other amazing projects with free patterns. Facebook fans 4,109. Twitter followers n/a. About Blog Hello! I´m Laura. I have been crocheting since childhood and on 2009 I discovered the fun of amigurumi. For the past years I have dedicated my creativity to the craft of amigurumi and I´m passionate about creating crochet designs and handmade toys. Facebook fans 14,086. Twitter followers 508. About Blog Hello everyone! I am Yunie, an ordinary girl addicted to crochet , living in a hot and sunny island called Singapore. Here you will learn easy amigurumi from tutorials and tips for beginners. Facebook fans 3,343. Twitter followers 867. CA About Blog Ami Amour is a crochet designer who creates adorable amigurumis and cute crochet patterns. Beginning in April 2006, she discovered her affinity to a yarn and a hook and found out she could magically conjure up creatures from just using fiber! Since then, she has been determined to carry out her mission in which she amasses a huge Amigurumi Army. Facebook fans 1,323. Twitter followers 1,833. Odense, Danmark About Blog In this blog you will find Amigurumi Patterns, Wedding Dolls, and Crochet Projects. Facebook fans 4,674. Twitter followers n/a. york, England About Blog My name is Liz, I'm a crochet designer. This is where I share all my crafting adventures with the world. Facebook fans 5,977. Twitter followers 762. About Blog Sweet Softies is a mini amigurumi and crochet store that provides cute patterns, plushies, and dolls. Here you will find videos of crochet tips, strategies, and project tutorials! Facebook fans 952. Twitter followers n/a. Where the international is About Blog A blog about amigurumi crochet, crochet clothing, flowers and animals with humor and funny stories. Facebook fans 339. Twitter followers 63. About Blog This blog is Dedicated to bringing you the cutest and awesom-est crochet amigurumi patterns. Find monthly exclusive patterns, video tutorials, giveaways, crochet-a-longs and more! About Blog Hi! I’m Femke. I live in Belgium with my partner, 5 cats & 3 chickens. I design amigurumi crochet patterns and have a little Etsy shop. About Blog A Tako-san blog for Amigurumi patterns and design. About Blog I love Amigurumi crochet, sewing and other D.I.Y. gifts. Hoping to inspire others to try something new! I frequently post tutorials with links to helpful resources so others can try them out too! Facebook fans n/a. Twitter followers 401. About - I’m Janine Holmes, the owner and designer behind Moji-Moji Design. I specialize in amigurumi crochet. I love the organic way of designing in this media with just a hook, a ball of yarn and my imagination. About - The blog of a crafter and amigurumi pattern designer. FREE crochet patterns shared on this page daily. About - Get top crochet patterns like christmas patterns, amigurumi and much more. About - Hello I’m Heather and I’d like to wish you a warm welcome to my little blog! I’m a thirty *cough* something, busy working wife and mum of two young daughters based in Staffordshire, UK. This is my place to share my love of all things yarny; I mainly write about my crochet and other crafty things but I also like to share little stories about my family and fun activities to do with children. 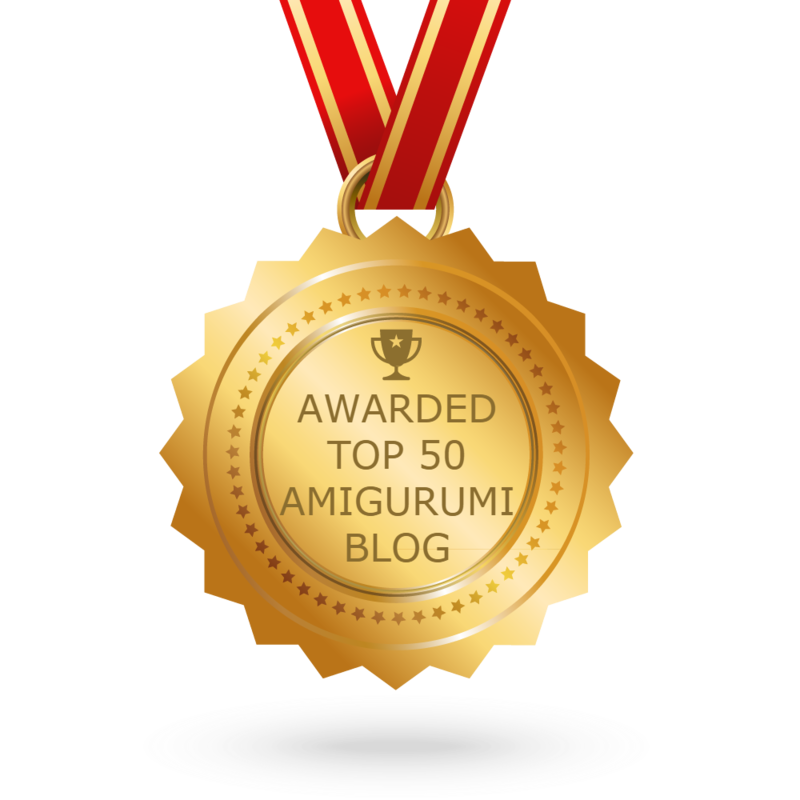 CONGRATULATIONS to every blogger that has made this Top Amigurumi Blogs list! This is the most comprehensive list of best Amigurumi blogs on the internet and I’m honoured to have you as part of this! I personally give you a high-five and want to thank you for your contribution to this world.